Lawn care and management consists of a wide set of activities that are coherent and complementary to each other. You can’t take care of your turf just by watering it without mowing it and you can’t tend to your flower beds without proper pruning for instance. In this grand scheme of things, fertilization & weed control are essential tasks that need to be performed carefully and thoroughly. They are essential for your lawn and landscape’s health and thriving, and they can’t be performed in the lack of other related tasks. Today we have our fertilization & weed control Southlake TX experts to talk to you about our complex programs. Why Should Fertilization & Weed Control Be Complex? Proper fertilization & weed control – the good kind, not the kind that burns your soil and kills off beneficial insects or provokes allergies in children – needs a set of prerequisites. Proper and professional soil assessments: many homeowners buy and apply store-bought substances without knowing anything about their soil’s pH and fertilization needs. Needless to say, this can lead to severe damages impacting the landscape and the environment as well. We, on the other hand, never perform such a treatment without assessing the soil, the vegetation, the micro-ecosystem thriving on your property, and the weather conditions of your area. Integrated services: as we said, you can’t perform a lawn care task and hope for the best as you don’t perform the others; we offer a full lawn maintenance menu which consists of an innovative fertilization program, disease and fungus control, insect and grub control, core aeration and high-quality weed control products. 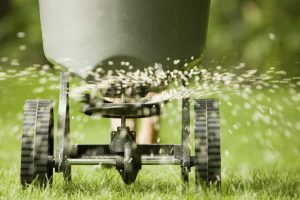 Proper fertilization & weed control should be planned throughout the entire year: we offer a comprehensive 7-step year-round program dealing with emerging weeds, seasonal weeds, weeds that are attracted by certain plants, and weeds lying dormant in the soil waiting for you to help them sprout and spread. Follow up is mandatory: when you treat an illness you surely visit your doctor during and after the treatment to make sure everything is alright; the same principle applies to our fertilization & weed control Southlake TX programs: our specialists pay you frequent visits to make sure the weeds stay at bay and to adjust or make small changes in the overall treatment plan for better results. All our fertilization & weed control Southlake TX treatments are designed to not only keep your landscape free from weeds, but also to enhance the strength of your soil so you can enjoy a vibrant, lush lawn all year long! Give us a call today and ask for a free estimate!